1. First cut out your pattern. 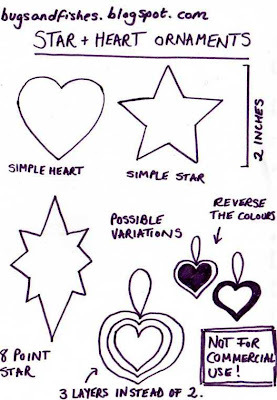 You can use my pattern sheet or draw your own simple shapes (cookie cutters make great templates). 2. Pick your colours. This ornament is based on simple contrasting colours: I chose red and white but you could pick any two to match your Christmas theme or make an assortment in lots of bright shades. 3. 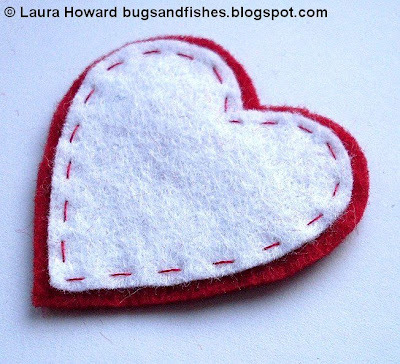 Pin the pattern to your first colour and cut it out. 4. Remove the pattern, put it to one side and pin the felt shape to the second colour - remember to leave space to cut a border round it! 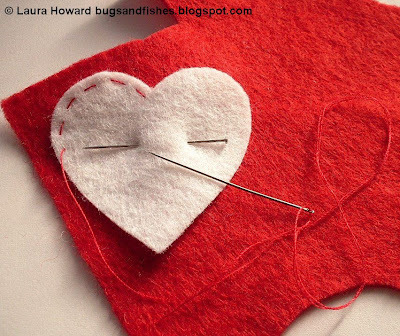 Then, using a contrasting colour sewing thread (I used red to match my background colour) sew the shape to the backing felt. 5. 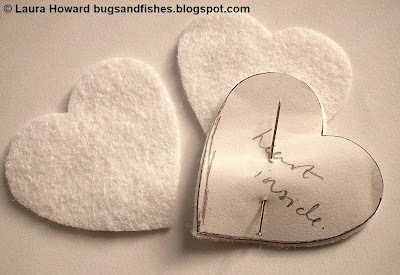 Now remove the pin and carefully cut round your shape, leaving a border of the backing colour to "frame" it: I cut mine quite narrow, but a wider border makes for a bigger bolder ornament. Remember: if you're not sure it's always best to cut a bit extra, as you can always trim some off if you're not happy with it at this stage. 6. You now have the front of your ornament. 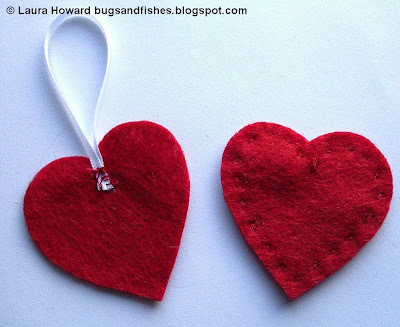 Use it as a template to cut out another piece of your backing felt the same size (this will be the back of the ornament). 7. Pick a piece of ribbon - I use simple narrow ribbons for my decorations but you could try wider pieces (the larger the ornament, the bigger the ribbon you can use) patterned ribbon, ricrac, or even knitting yarn or string: anything you're happy sewing with! When you put the front and back of your ornament together the messy ends of the ribbon should now be hidden between them. Use thread that matches your backing felt to help hide your stitches. 9. 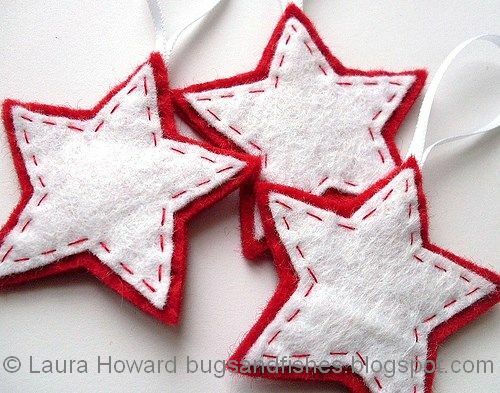 Now you're ready to sew your ornament together. 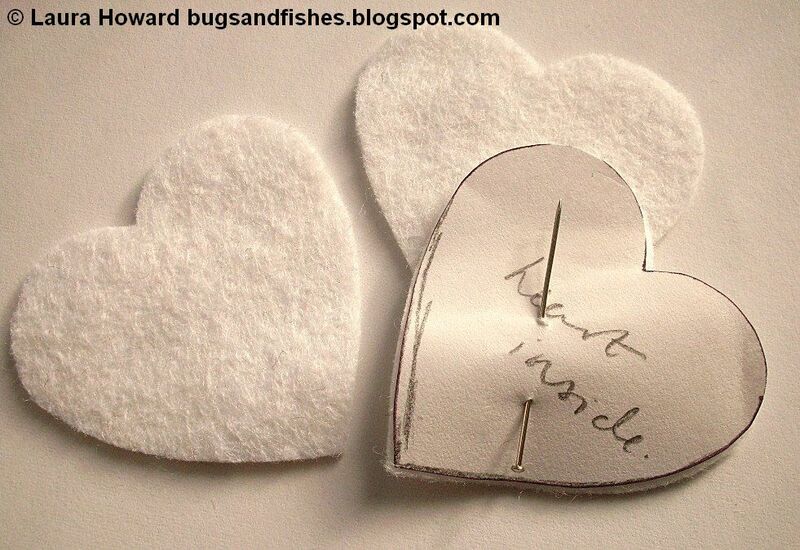 Pin the front and the back so they're exactly how you want them, with the ribbon emerging from the top. Then, starting from the ribbon sew all around the outside "border" in matching thread, as close to the central shape as possible (again, this keeps your stitches hidden) ... and you've finished! VARIATIONS: As discussed above, you can use different colours and ribbons to great effect with this simple pattern. Any simple shape can be used - dig around in your cookie cutter drawer to see what you can find, or sketch your own patterns. 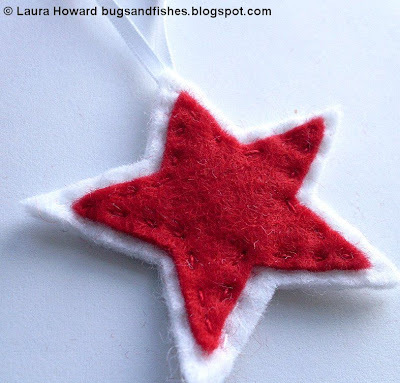 I've added an 8 point star template to the pattern sheet for you to try. You could also make larger and more colourful ornaments by adding extra layers - repeat stages 4, 5 & 6 to create more elaborate layered designs. Please note: this tutorial is NOT for commercial use. 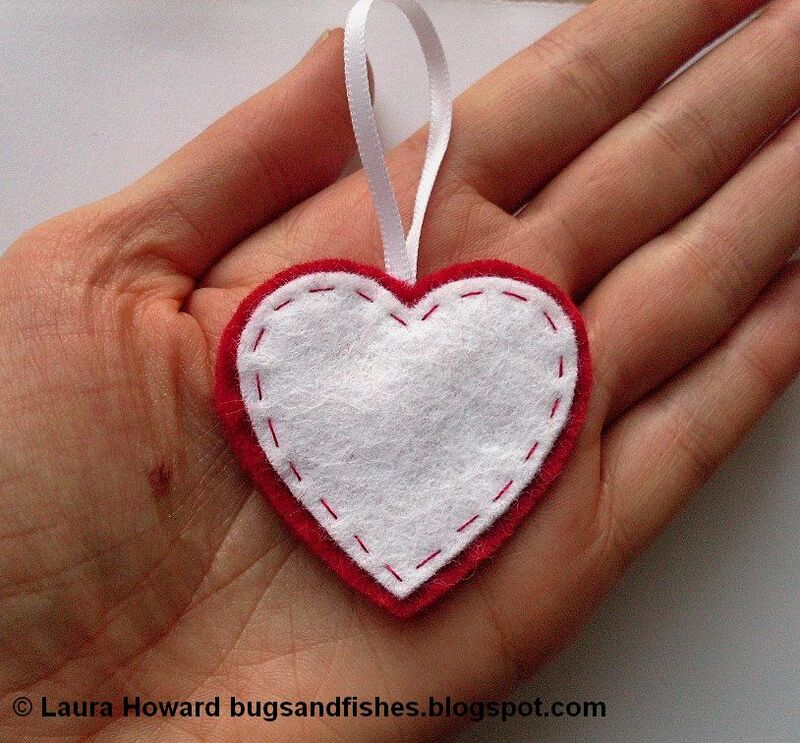 You can make as many of these ornaments as you like (they make great gifts!) but please don't sell them or reproduce my tutorial anywhere without my permission. 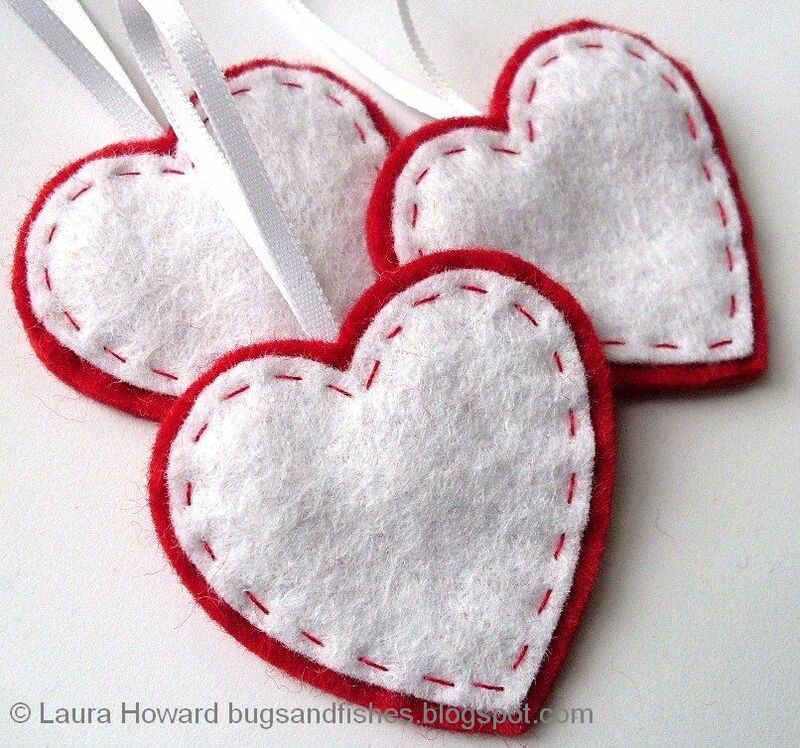 If you give it a mention, please do link back to the original page & if you make the ornaments please let me know - I'd love to hear how it went & would adore to see pictures! Wonderfully written tutorial, I can't wait to use it. Do you use a specific kind of felt (wool, etc.) or just the stuff I can get at Michael's? Tag, you're it!! Hehehe, it's a game :) you can read about it here. Off to buy some felt and try this with my son...he's sooo 12 years old, but he might have a go at this as we head in to a week calling for rainy days....thanks for sharing this! Cool tutorial! They are so pretty. Thanks for sharing. There are gorgeous and will definitely help to make my christmas tree more beautiful this year. I absolutely love this idea! I have been looking for something I can make to attach to my gifts this year and I think I may have struck gold! I may try stuffing some of them for a slightly different effect. Thanks so much!!! Love this tutorial thank you so much for sharing it with us! Thanks for more ideas! I just started today, a gingerbread ornament. watch my blog for it. Your ornaments are so cute! Thank you for the tutorial! My friend told me to look at your site. I am excited to try a few of these. Thanks for sharing! I had to help my 8yo with the cutting out but she did the stitching herself. She made them to adorn a Christmas Tree dress I made her and went off to Brownies tonight all dressed up and so proud of herself! These are just adorable! 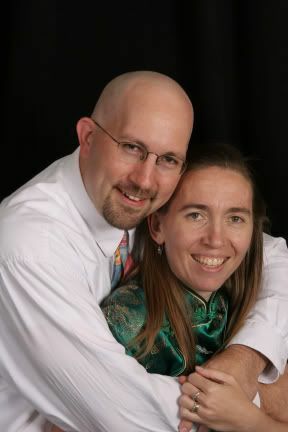 I will be featuring them in a post on Tuesday. I hope you do not mind. I am sharing one picture and a link directly back to this post. Thank you for this fabulous tutorial!